Artists includes: Paul and Steven Claydon, Kajsa Dahlberg, Chris Evans, Robert Garnett, Babak Ghazi, Mark McGowan, Goshka Macuga, Elizabeth Price, Mandla Reuter, Jamie Shovlin, Matthew Thompson, and Tris Vonna-Michell. This exhibition takes its lead from themes of personal history and memory raised by Christopher Priest's 1981 novel The Affirmation and, through the lens of a more antagonistic and critical form of interpretation, aims to point towards an overtly positive viewpoint on contemporary art practice over any traditional melancholy fixation. 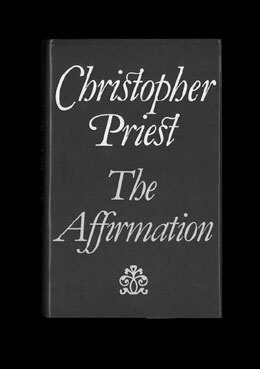 If we look at the main character in Priest's book, Peter Sinclair, we see a man tormented by bereavement and failure. At the beginning of the story, Sinclair's life starts to crumble before him in his London flat, and after being offered a place to stay by an elderly couple in return for work on their new home, he embarks on an autobiography while temporarily residing in their small cottage in the English countryside. However, he soon finds himself writing the story of another man, 'affirming' a parallel identity in an imagined world, a persona whose sinister attraction draws him forever further in. Similar to this, each of the twelve artists in this project have been encouraged to reconsider, reorder or scramble their own artistic identity, and consciously distort forms of art history in a way that goes beyond mere ironic appropriation, and extends out towards a new and unfamiliar view of the world. As well as making new work for the exhibition, each artist has been invited to work with the Special Collection at Chelsea College of Art and Design Library. By considering the archive's contents and making small interventions, artists have been able to create new configurations of artefacts that might question or throw historical discourse into doubt. Each artist has been able to find their own connections within the library's archive, and fictionalise a personal narrative within its contents. In one sense, the context of affirmation and the chosen literary reference point, shows the paradox of asserting one's confidence in oneself and contemporary discourse, while simultaneously insisting or establishing a different position. The narrative of Jamie Shovlin's project, for example, contains a similar twofold logic to Priest's book. Each of Shovlin's photographs of his home town, and his father's home town, are indebted to two works within the Special Collection, with which they are exhibited: Ed Ruscha's 1966 book Every Building on the Sunset Strip and the 1998 addendum by Jonathan Monk None of the Buildings on the Sunset Strip. This work can also be seen as a response to the second part of Bas Jan Ader's 1973 three-part In Search of the Miraculous (reproduced in the exhibition booklet), which features night-time photographs of Los Angeles set to the lyrics of the song Searchin' by The Coasters. All three referenced works are explorations of place by a foreign author; Ruscha hails from Oklahoma City, USA; Monk from Leicester, UK (coincidentally Shovlin's birthplace); Ader from Winschoten, the Netherlands. Shovlin's response attempts the exact opposite: an examination of the immediate, over-familiar environment that has subsequently been left behind. Similarly, Tris Vonna-Michell's work for The Affirmation dwells on the artist's large personal archive of transparencies. These images will be shown alongside a new audio soundtrack containing a rampant and manic spoken-word monologue by the artist that refers to the variety of subject matter within Vonna-Michell's collection, and aims to incorporate a sublime summary of his burgeoning storytelling ability. Kajsa Dahlberg's also uses fiction in an interesting way. Dahlberg has registered a non-existent book into the electronic catalogue of the library as a silent revolt against the huge amount of information contained there; not only does this form a counterpoint to a monumental database of books, it also creates a space that hasn't previously existed in Chelsea's archive. Paul and Steven Claydon, by turns, have taken the nature of duality a stage further. As twins, they have decided to work together to invent a Vorticist-inspired movement called 'Explosive', and archive material on both movements will be shown during the exhibition. With this in mind, each artist in the exhibition will also be asked to donate their new work to the Special Collection once the exhibition has finished, so that it will automatically be placed alongside the existing material it refers to. In all, chosen material will range from artists' multiples and ephemera, to images from magazine pages and criticism. The writer Robert Garnett will also present large-scale collages that enquire into the aforementioned theoretical relationship of the project, a context that critically pits affirmative thought against the Hegelian polarity of Sinclair's split personality in a deeply uncomfortable manner. The exhibition's curator Andrew Hunt has previously organised independent exhibitions such as Like beads on an abacus designed to calculate infinity at Rockwell in 2004, and Writing in Strobe at Dicksmith in 2006, both of which used literary themes to investigate new possibilities for aesthetic experience, curatorial presentation, criticism and interpretation in contemporary practice. The Affirmation continues this line of enquiry in an overtly optimistic manner, so as to navigate and question the discordant grey area between literature, writing and art practice, and connected relationships between incongruous forms of thought.